It’s a full time job tracking appointments, engagements and commitments. Keep it all straight with the Day Designer, a beautiful spiral bound book that’s part planner and part life coach. This calendar helps you plot not only your weeks, months and year, but your hopes, dreams, and life goals as well. Day Designer’s layout includes space for priority “to-do's," expenses, meal planning and the all-important “don’t forget” items. But what makes this daily diary truly unique are embedded daily motivational quotes and a designated area to jot personal thoughts and gratitudes, so you can stay focused on what matters most: your health and well-being. Creator Whitney English produced Day Designer to organize and balance her own life. Unlike other daytimers, this one not only schedules time, but keeps you mindful of your guiding philosophies and personal objectives. 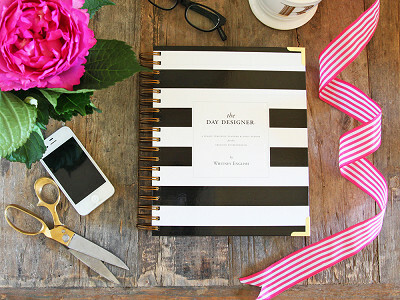 The Day Designer is a way to stay organized day to day while focusing on overall mindfulness. Sometimes we get so bogged down in the details that it's easy to forget the big picture, but the Day Designer keeps those bigger pictures clearly in focus. Please feel free to ask any questions you can think of; it's a pleasure to share this with all of you in The Grommet community! This looks like a great planner. I agree, it is so easy to get bogged down in the daily "to-do's" that I forget the big picture. Question: On what date does the planner start? January 1? Just curious...I couldn't tell from the pictures if the dates were on each page. @Tess i love, the concept, design and thoughtfulness. The only thing that is stopping me from purchasing, is that i would love to carry the planner with me, and wish it had some type of closure. i have had spiral bound planners before and the pages get really tore up inside a tote bag. I would hate to rubber band this one, it's so pretty! @Guest A place to carry a pen or pencil would be good also, if you are going to carry it with you. @Tess - this edition runs August 1, 2014 - July 31, 2015. 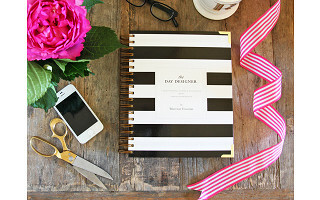 @Guest - we recommend using an elastic binder band--I got my personal ones at Target--black and white striped and so cute! I LOVE THIS!!!!!!!!!!! so much. @Anna thank you, Anna! I love all your exclamation points! Will this planner support the ability to purchase refills in coming years, or will I have to purchase a whole new planner in 2015? As much as it contains, $60 for one year seems a bit high. What a great product! I could have used this years ago to keep me focused on my goals, instead of being all over the place. Those of us with ADD really need something like this. And I especially love the Gratitude space, because you are right...remembering to be grateful throughout the day is the key to a joyful life. I love it! @Jennifer I completely related to needing this to help with ADD! It also helps me remember what I've accomplished over the year, since my to-do lists are basically all bound together in one place! This looks nice. I am wondering what day of the week the monthly calendar starts on. I have a strong preference for monthly calendars that begin on Sunday. @Carol me, too, Carol. The monthly calendar weekday begins on Sunday! Wow! 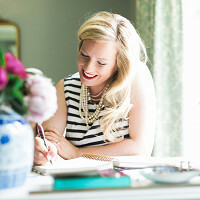 I had just posted on my facebook page (www.facebook.com/KirstenEMitchell)of my struggles as a newly retired and hopeful entrepreneur trying to prioritize everything that i want to do, now that the structure of my workday is gone. What a fantastic idea this is! I am ordering one! @Kirsten yay, Kirsten! Thank you! I hope you love it! Does this start in January 2015? @Gwendolyn the dates of this planner are August 2014 - July 2015. There will be a January edition released later on this year! I love the layout, design, thoughtful sections and especially the space for daily gratitude. Wish you had a digital edition that was just as beautiful and helpful as your notebook. Nothing like this exists in the digital world. Would make a great app. Are these available for immediate shipment? @Patricia I believe so! I think they can expedite your shipping at check out! Don't need it expedited . Just need to know I won't have to wait two or three weeks to get it. Defeats the purpose of having it start in August if one doesn't receive it until September. I just ordered it and it reads 2 to 3 days. I am excited to get it. Great product and beautifully executed. Is it possible to provide close up pictures of the pages? The page details are difficult to see in the pictures provided. Thanks. @Guest I'm not sure if they are able to load more photos at this time! If you do a google search you can find great photos from past customers! Many different types of pages exist in the book. The video shows several close-up's very well. Is there a specific page you'd like to see in more detail? Will you continue making planners that run from August to July so that if I buy one now, I'l be able to get one next year that begins on August 1, 2015? @Lisa as of right now we are planning on it! We also have a January 2015 edition that will be out in about a month! @Cate there is not a designated address book section! There is plenty of room for notes, but not a specific location. What about Sunday? All the planner I see have only half day for Sunday. Sunday is big day for me I need the whole page. Also prefer the week to start on Sunday. @Helen the "weekend page" is split, with a column for Saturday and a column for Sunday. The page is designed to accommodate your schedule for both days! Hi, this planner looks perfect - an improvement on an already excellent planner that I currently use. Will the January edition also be for sale here at The Grommet? Wishing you much success! It’s a full time job tracking appointments, engagements and commitments. Keep it all straight with the Day Designer, a beautiful spiral bound book that’s part planner and part life coach. This calendar helps you plot not only your weeks, months and year, but your hopes, dreams, and life goals as well. Day Designer’s layout includes space for priority “to-do's," expenses, meal planning and the all-important “don’t forget” items. But what makes this daily diary truly unique are embedded daily motivational quotes and a designated area to jot personal thoughts and gratitudes, so you can stay focused on what matters most: your health and well-being.